The snow is melting and there are plenty of signs that the Delaware River Valley is coming to life, which means it is the ideal time for enjoying a relaxing and refreshing getaway to Frenchtown NJ! The crocuses are soon to be in bloom, buds are forming on the trees, and the chirping birds have returned from their southern migration (perfect for you bird watchers!). This spring, you can enjoy a feel-good getaway and take advantage of our 15% off 2 night promo! Looking for a weekend away? Stay two weekend nights and save 15% off on select rooms. 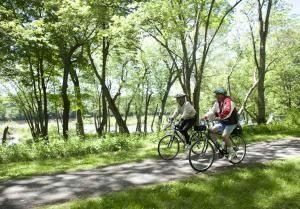 The countless Hiking and Cycling trails along the Delaware River are all waiting for springtime explorations. So this spring, head to Frenchtown NJ and the Widow McCrea House for the perfect springtime getaway!